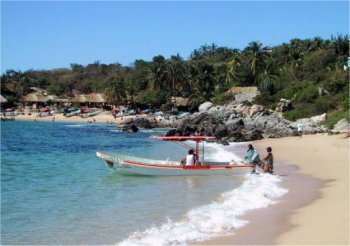 Puerto Escondido, 150 miles south of Oaxaca City, lies sheltered in a large bay along the little-traveled southern coast of Mexico. 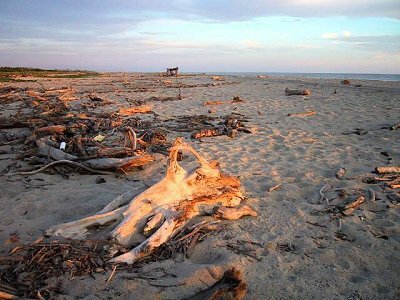 Tucked between the Sierra Madre Sur and the Pacific Ocean, this hidden port is less famous than the country's mega-beach resorts, yet you'll find several beaches and surprises at every turn--if you're willing to explore. Take Playa Carrizalillo, for instance. Just a few minutes west of the town center, this crescent of sand, framed by rocky outcroppings topped with prickly bushes and scrub trees has crystal clear water and a picture-perfect setting, sin towel-to-towel bodies. Like Puerto itself, it's access isn't for the feint of heart. You used to have to slip and slide down a hardscrabble slope, steadying your step on an occasional root. However, nowadays steps are the thing. East of the former trail, you'll find a winding staircase, painstakingly formed with rock and cement. No doubt the 167 steps leading to shore's edge discourage a few sunbathers. 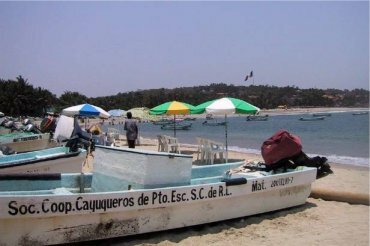 If steps aren't your thing, for less than $3, you can hire a lancha, one of several water taxis that shuttle between the main beach and the smaller coves of La Manzanilla, Puerto Angelito and Carrizalillo. Depending upon your skill and the strength of the usually gentle waves, you might get to shore without getting your camera wet. This beach is worth the effort if you want to swim because the waves are generally gentle. Although only a short distance away, this scene is a far cry from Playa Principal. If you venture no farther than the main beach, you'll probably write your friends back home that fishing boats bob on murky water. You'll tell them that smells of newly caught sailfish, tuna and red snapper, their fins still faintly flapping, mix pungently with seamen sweat while restauranteurs select their catch of the day. 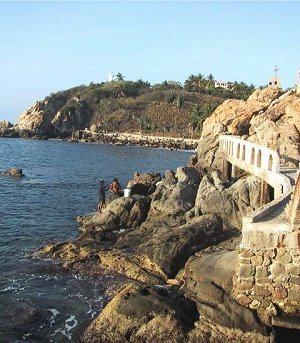 Playa Principal is where you'll get a sense of an authentic, active Mexican fishing port. 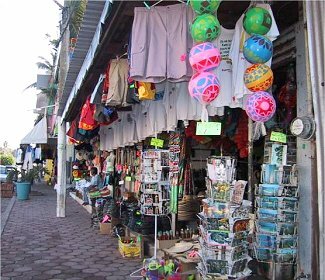 Along the Adoquín, the main street which parallels this beach, you'll find day-long Happy Hours and sidewalk stalls of sarongs, sandals, swimwear and suntan creams. Later in the evening, disco duels in beachfront bars lure young travelers ready for a night of whatever it is they came to Mexico for. However, in the past couple of years, even the Adoquin has changed. It's facelift includes new pavers, wider sidewalks filled with plantings of palms and flowers, and new shops of fine gifts, art and jewelry mingled amongst the bean beads and macrame bracelets. The Adoquin closes to vehicular traffic in the afternoon and evening, providing a peopled promenade for shopping and lollygagging. To the east, like an outstretched arm, Playa Zicatela reaches as far as the eye can see, beckoning surfers. Considered the best pipeline in North America, the waters of Zicatela challenge the non-feint-of-heart to catch a wave without being dragged out to sea in the strong undercurrent. Along Zicatela beach, you'll find a smorgasbord of sidewalk cafes, tableclothed restaurants and rustic palapas, some on the road across from the beach, others on the beach itself. 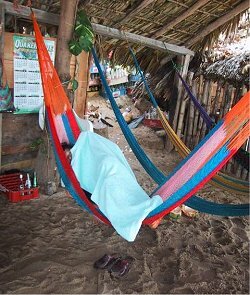 Sleeping places range from hammocks to upscale hotels and everything in between. My favorite Z-spot is El Jardin de Rafaela, a few yards beyond where the pavement turns to packed sand. Even Rafaela has caught the wave of change and updated her small lean-to café into a complex of beachfront palapas, designed to trap ocean breezes and sprinkle them among hammock-lazing diners. 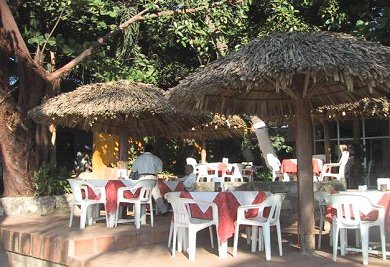 Satiated with home cooked fish, spiced a la Rafaela, I shared this magic spot with only a few people in January of 2003. I ate and drank and sunned and read all Sunday afternoon, almost alone. The surf wasn't peak but some faithful surfers waited patiently for the occasional crest, while Deb from Canada firmed her No. 10 figure with serpentine stretches and yoga twists on the hardpacked sand at ocean's edge. Cabanas, bungalows and palapas have sprouted up in recent years, interrupting the former desolation of the far end of this beach. 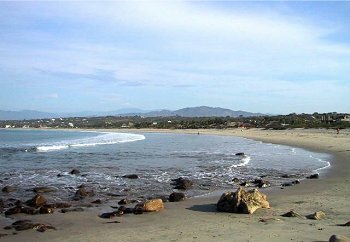 Don't expect crowds here, however, and it's still advisable to walk, talk, sleep and drink with a friend or two, rather than alone, in this hinterland known as La Punta--the point at the eastern tip of Playa Zicatela. If you've left your stairstepper at home and are missing it, head west from the Harbormaster at the west end of Playa Principal. Hurricane damage now repaired, the rollercoaster-like staircase winds among rocks, turned white from perching pelicans waiting patiently to dive into schools of fish drifting by. Not far from the harbor, you'll be surprised to find a restaurant/bar built among the rocks at Cove Piedra. Owners, Cathy and Matt of the discotheque, Tequila Sunrise, have opened a breezy afternoon hangout. Try her homemade shredded pork sandwich or nibble on chips dipped in flavorful salsas as you sip your cold one. The stairs to nowhere continue to wind up and down and around, past Tequila Sunrise and the lighthouse, for maybe a half mile or so, ending at a condo complex west of town. On your way, you'll come upon boys and girls hugging, as well as young daredevil divers, and fishermen casting about for their family meal. If you go back out onto a eastbound street and then back toward the beach in an exploration mood, you'll find the twin beaches of La Manzanilla and Puerto Angelito, separated by a rocky outcropping. This sheltered cove is also good for swimming. 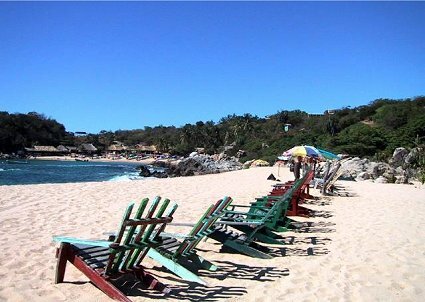 Less than an hour by bus, along deserted, not easily accessible beaches, you can be on the popular beaches of Zipolite, Mazunte and Puerto Angel, where there's even less hullabaloo than Puerto Escondido. 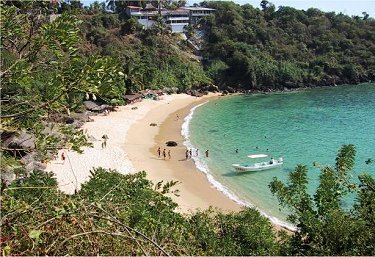 You'll find lots more, of course, waiting to be discovered along this wild coast of Mexico, such as the Bays of Huatulco. Each stretch of beach and hidden bay has its own personality and secrets. It's difficult to peg people you'll meet in Puerto into round and square holes. You'll find aging hippies who wandered down in the 1970s and never left, having traded Coors for Corona. Always there are young and old travelers passing through on their 'round-the-world soul search. Some travel on a budget with backpacks; others are spending their trust funds; still others come seeking non-ritzy resort escapes. 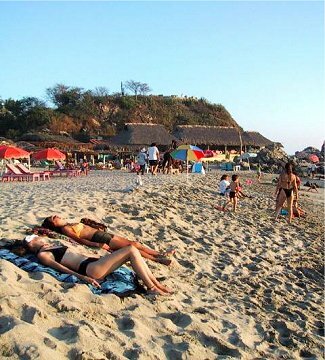 The sun and surf of Puerto Escondido attract a variety of vacationers--from pot-bellied oldsters to budget travelers (who are so skinny their navels almost touch their coccyx). 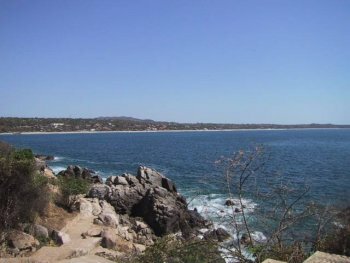 There's also a growing number of expats living in Puerto Escondido, some year-round, others snowbirds. Most have traded shirts for sun tans and glitzy for funky. They operate a library, give parties, share travel tales and organize fund raisers for the needy. Not so different from expat communities throughout Mexico, except they're Puerto-ized-- in a hypnotic kind of way. Your first stop will be Gina's tourist information booth on the west end of the Adoquin. She dishes out information in big helpings with a smile, and it's safe to say she knows more about Puerto Escondido than any other person. On her days off, Gina offers walking tours to the market and to little-known nearby ruins. Filled with history and information on native vegetation, a day with Gina promises fun, adventure and insight into local culture. In addition to Gina's guided tours, travel agencies offer excursions to nature reserves, where you can get up close to sea turtles, alligators, and a variety of birds and water fowl. Or, visit Paul Cleaver's organic farm and coffee plantation. Owner of Tabuchin bed and breakfast in Puerto, he'll take you to his ranchero about an hour north for a luscious meal of homegrown fruits and vegetables and a tour of his Modest Museum of Art, his eclectic lifelong collection. For reservations: 52-954-582-1179. 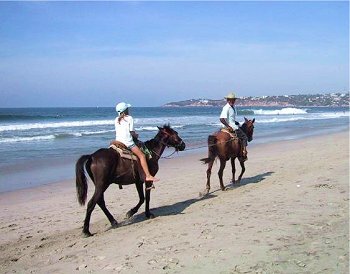 You'll find horses waiting to be mounted (and rented) on Zicatela Beach. Boat captains will take you out to sea for a day of fishing or sightseeing. Look for them on Playa Principal. You can spend many an hour walking along the sandy beaches (not advisable at night, however) or exploring side streets that meander toward the small bays to the west. End your meandering with a nap in a hammock. The Adoquin is lined with restaurants specializing in fish, Italian and French fare, Spanish specialties and of course all manner of Mexican. These restaurants can be accessed from the street or the beach. A friend of mine labeled the eastern end of the Adoquin as Little Italy, given its proliferation of Italian style restaurants. 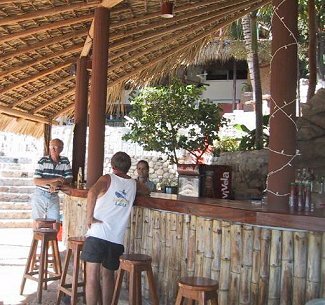 Danny's beachfront bar in Hotel Rincon del Pacifico is a popular tourist happy hour spot. Bananas advertises Happy Hour from 5 to 9 p.m.
serve mugs of steaming coffee and a dozen or more choices of breakfasts. La Cafecitas are open all day and evening and are a sure bet for homecooked meals. The first of these cafes, across from Hotel Flor de Maria on Marinero Beach, is still a popular eatery. 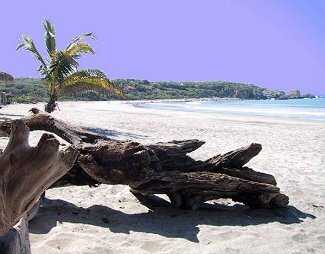 Also, on Playa Marinaro at the rocky outcroppings that define Zicatela beach, you'll find the Split Coconut. After 5 p.m., simply follow the smell of ribs, chicken and burgers sizzling on red-hot charcoal or listen for the noise of its rock and roll happy hour. 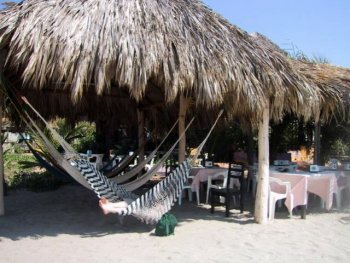 My favorite, El Jardin de Rafaela, is situated just beyond the pavement along Playa Zicatela. Farther along on the way to the point, you'll come to various palapas and cabanas serving tacos, fish, and cervezas. In the afternoons, I like to plunk down at a shady table in Tequila Sunrise's café, hidden among the rocks just west of the harbor. On weekends, Tequila Sunrise, Puerto's largest discoteque, attracts all ages to its tiered beachfront dance floors. Turn left at the corner past Gina's tourist kiosk and walk up the hill a short distance. Next door, you'll find live music at El Son y La Rumba where Mayka and her band entertain nightly with original songs and old standbys for listening and dancing. One of the few night spots with live music, Mayka is a famous Puerto person. There's a new movie theater on Playa Zicatela-- PJ's Book Bodega and Music Shop. PJ, an enterprising young man has constructed a large screen, hauled in some beach chairs and serves up popcorn and movies nightly. West of town, try Hotel Posada Real. Even if you don't stay there, its Coco's Beach Club is worth a day's visit. The beach from here stretches uninterrupted for 60 miles. Usually there's a strong undercurrent, however, so it's only for hardy swimmers. Reserve through Best Western in the USA or call 52-954-582-0133. There's a beachfront campground on Playa Principal and any number of small posadas and guests houses with Rooms for Rent scattered throughout. Look for their signs. You probably won't find them on the Internet and they may not have a telephone. 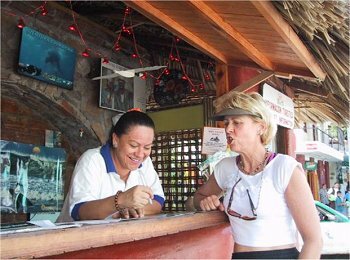 In Puerto Escondido, you'll have no problem finding lodging, except during high holidays, especially Christmas and Easter. 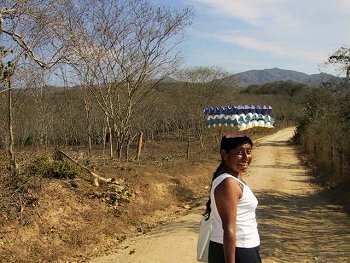 Although only 150 miles, maybe less, the road from Oaxaca City to Puerto Escondido goes over the Continental Divide, so many hair-raising curves and awesome views await you. Expect rock slides and washed out road conditions, especially in the rainy season. Plan on 5 to 6 hours' driving time. By air from Oaxaca City, two airlines offer daily flights: aerovega@prodigy.net.mx and info@aerotucan.com. About 45 minutes and probably more than $100 USD pp. one way. First class buses leave from the ADO terminal in Oaxaca city and go through Salina Cruz (10 hours), about $20. Or, you can take Estrella de Valle buses which leave from a small terminal across from the Red Cross in Oaxaca City. Or, there are also first class buses that leave from the second class bus station. One of these, Estrella Rojo, has new, comfortable buses. These latter two cost about 90 pesos and take 6 to 7 hours. This page has been visited times since November 26, 2009.